Our Brand Is Crisis means to cast a harsh light on presidential campaigns, but it mostly just panders. The new film from director David Gordon Green (who’s done everything from George Washington to Pineapple Express) spends way too much time congratulating you for agreeing with its cynical perspective—only to later congratulate you for not really agreeing with its cynical perspective and instead embracing the optimistic, touchy-feely notion that each of us can truly make a difference in the world. Either way, this movie is as hollow as any candidate, aggressively market-tested to the point of passivity. This comedy-drama, “suggested” by the 2005 documentary of the same name (that means the filmmakers here took a lot of creative license), stars Sandra Bullock as Jane Bodine, a onetime superstar campaign strategist undone by depression, substance abuse, and an ethics probe. She’s out of the politics game when she’s approached by the campaign team (including Anthony Mackie and Ann Dowd) of a Bolivian candidate named Castillo (Joaquim de Almeida), who was president of the country about 15 years ago before his lousy policies got him voted out of office. Castillo is running again—and is about 30 points behind the front-runner. His American strategists hope their countrywoman can pull off a miracle, and they rope her in by revealing that Castillo’s opponent is being managed by Pat Candy (Billy Bob Thornton), her longtime adversary. But as laid out by Green and screenwriter Peter Straughan, there’s not much sting or fun in that irony. The film tries to project a world-weary, seen-it-all-before tone to suggest how blasé these American strategists are about their job—they don’t care about truth or fairness, just that their guy wins—and then tries to recruit the viewer into adopting the same mindset. From the beginning, you’re meant to be on the advisers’ sides, seduced by their competitive fire. We don’t get inspiring speeches about hope and change—instead, we get elaborate number-crunching and tactical breakdowns of talking points. The movie’s title is at the heart of this attempt at a wised-up, unromantic view of politics: Jane’s major inspiration for Castillo is that he needs to scare voters by saying that Bolivia is in crisis, the thought being that when an electorate is scared, it will go for the guy they know (but may not love) rather than the guy they don’t know. 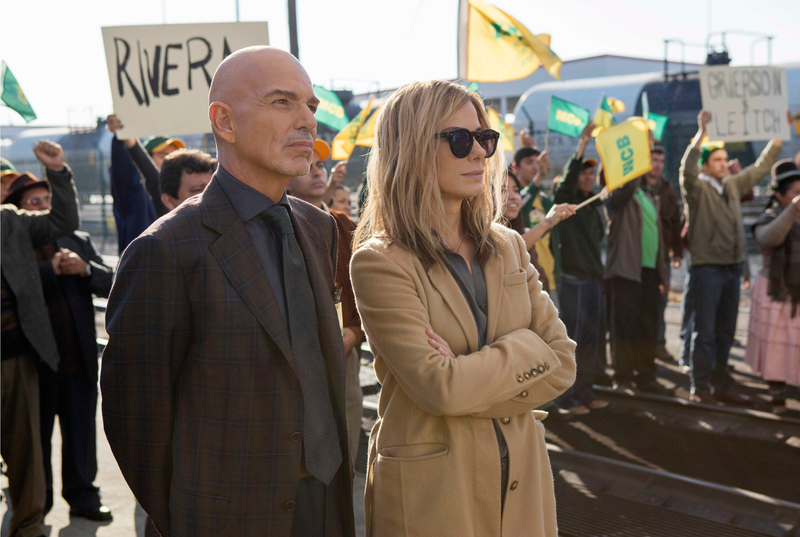 No question there’s some truth in that dark joke, but Our Brand Is Crisis spends so much time focusing on its simplistic insights about modern elections that two things happen. The first is that the movie becomes awfully repetitive—it’s cynical in a very predictable way—and the second is that, eventually, we start to figure out that the film’s worldview is meant to be a feint, a way to distract us from anticipating the character change that will eventually come. Bullock is awfully entertaining as the no-nonsense, sardonic Jane—she’s not unlike her character in The Blind Side, except here she doesn’t have to be sweet at all—and her flirty standoffs with the cocky, contemptuous Pat are the film’s constant highlight. But she’s forced to sell an impossible character. A long time ago, Jane genuinely believed in politicians, but since then she’s preferred remaining dispassionate about her clients as a way to keep from getting emotionally invested. The problem is that Jane isn’t ruthless enough for us to really buy that she’s a coldhearted, ends-justify-the-means operative. There’s always too much of Bullock’s natural likability that seeps through, constantly tipping us off that we shouldn’t actually think of her as a fierce political mercenary. She’s really a good person, guys! You’ll see! And eventually we do. Eventually, the presidential election becomes less important than how Jane feels about her job, and there’s something awfully condescending about the fact that an American woman gets to become a better human being as a side product of sowing discord in a South American country teetering on the edge of revolution and economic collapse. Of course, the movie doesn’t see it that way: It’s too busy relying on a swelling orchestral score so that we’re moved by the film’s the-people-have-the-power message near the end. A lot of presidential hopefuls don’t want us to vote just for them, but for the narrative they embody. With Our Brand Is Crisis, I sat there agreeing with the agenda while being endlessly irritated by the accompanying self-satisfaction. Their brand is smugness.